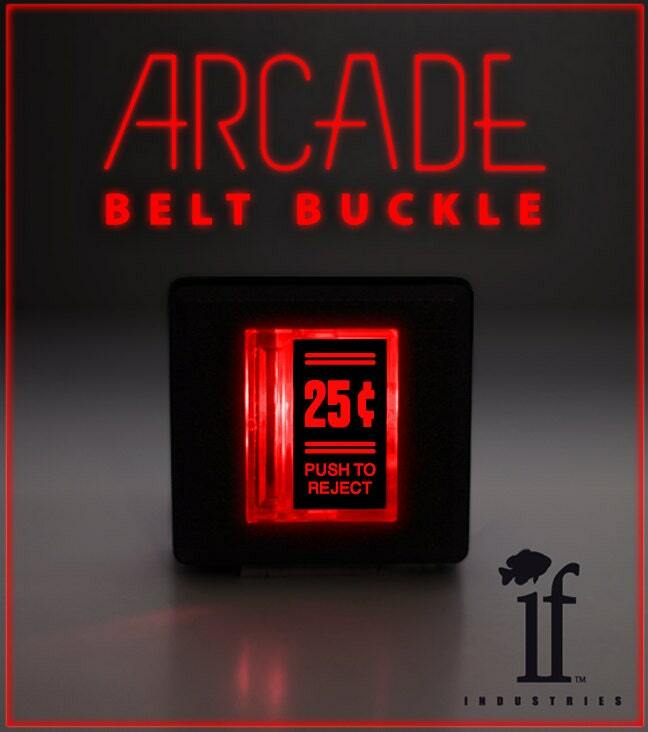 This Belt buckle is made from genuine arcade parts. With the light turned on, it looks exactly like the big arcade machines! The Buttons are made from Wells Gardener/Coin Controls coin door parts. if you need a belt we can help! The metal back that we designed is now made in China... and now the buckle half the price it was when it came out in 2012. CHECK US OUT ON THE INTERNETS! Copyright © 2012-14 if industries, llc. All rights reserved. As a child of the 80’s, I absolutely LOVE this piece. I bought one for my best friend around two years ago. I finally came to the conclusion I needed one myself. It is an extraordinary piece of nostalgia and will do well as a practical item in my own collection of retro video gaming. It’s everything you see before you. I cannot wait to wear it to my local arcade! It's great! Exactly what I was hoping for from the pictures! The battery doesn't last quite as long as I expected, but it will get you through several days of being turned on before the LED starts to dim a little. Plus it's pretty easy to swap it out the battery. The belt buckle arrived in time for Christmas and was very well received. The LED light is very bright and makes a great style piece as well as talking point. It has a great vintage feel and just makes you happy to see it glow! send us money, we send you stuff. Just like magic, but almost entirely unlike magic, just more magical. US orders sent USPS with tracking. International orders are sent USPS Air Mail, and are not tracked or insured. We can insure and track it but it will cost you like $80... so please ask should you really want. We are not responsible for bad shipping information. If a package is returned to us the buyer is responsible for re-shipping costs. Our products are intended for adults, not for kids. Buyer assumes all responsibility for their purchase, forever and ever times infinity.